Preston Burke has always wanted to be chief resident and until the arrival of Sheppard, always presumed he would be. But after a firm warning from chief surgeon Richard Webber that he needs to step up a gear in order to be any match for Sheppard, he is forced to reassess his work ethic and go that extra mile. 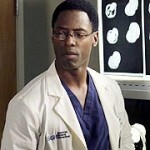 Preston Burke takes the challenge to heart and will do whatever it takes to impress his boss. Here marks the start of a rivalry with Sheppard that he’s determined to win.